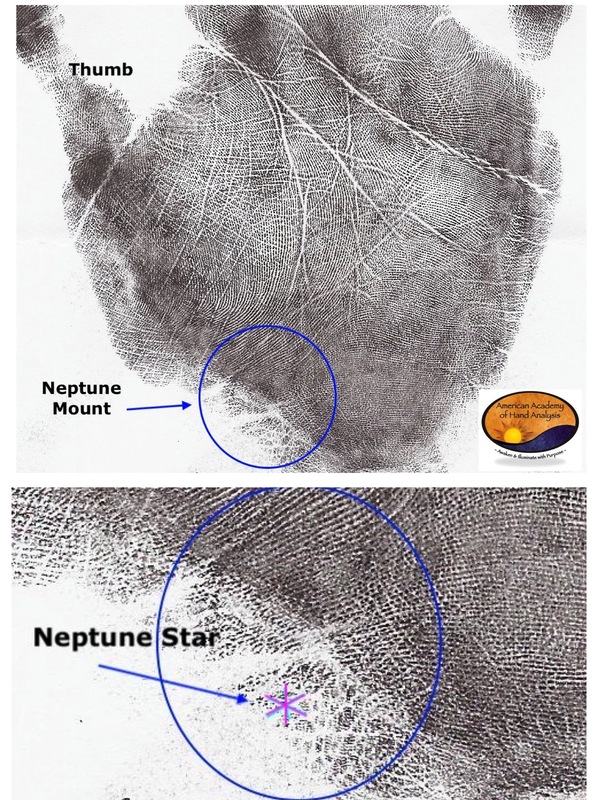 Your short lesson today is about a marking that can appear in the hand called a Neptune Star. The Neptune Star is a six-pointed star that looks like an asterisk in the bottom middle area of the palm on the Neptune Mount. The configuration of this star will not include the Life or Fate Line. This marking can usually be seen with the naked eye and sometimes on the inked handprint if the lowest section of the palm is captured on the print. Look carefully for this glyph because it does like to hide. On rare occasion more than one star can be found in this location. In such case, the following description intensifies and needs to become even more of a centerpiece in one’s life. At his or her best, the owner of a Neptune Star comes to profound understanding and awareness through unfathomable waves of intense emotion. 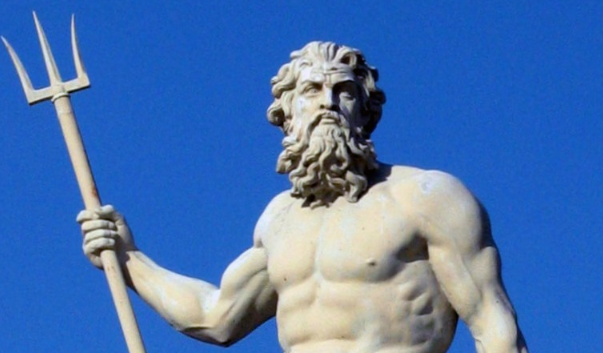 Neptune is the mythological god of water and the sea. Think about the sea and what happens there? The deepest chasm of the ocean has its own rhythm and experiences unpredictable storm systems. The ocean itself sways between the extremes of majestic stillness and unforgiving squalls. Emotions are ruled by the element of water hence the relationship with tranquility and tumult. The owner of this star can be utterly baffled on the path to understanding the ‘gift’ in this marking. He or she may be riddled with tears and have no words why. When people close by ask “why are you crying?” s/he is unable to articulate the ‘reason’ because even s/he does not have a reason why. The ‘happy’ tears can come just as easily as the ‘sad’ tears. This depth of sea employs no rationality. Astrologer Paul Grell said, “Neptune reaches both the most sublime heights and the lowest depths.” When the awareness of this keen and profound understanding is grasped just enough, the owner can begin exploring her own deep and heavy feelings. These feelings are most likely difficult, unpredictable, scary, and dark and whatever else happens in the deep, deep oceans. Grief Counselors help people through nearly unbearable transitions. Hospice Workers guide and prepare listeners through the death experience to new realms of life. Owning this marking and the accompanying traits will enhance the ability, approach and success of these counselor types. Psychic Medium, John Edwards of Crossing Over may have this marking of profound awareness along with the ability to translate that understanding to individuals who are in deep pain, ache and tenderness due to loss. If you see this marking in someone’s hand just ‘sit’ with him or who who may be out of touch with what he or she doesn’t know he or she’s out of touch with. Sitting with the owner means being quiet, still, and holding space for the deep seas to stir in accord to his or her own restlessness – within. Be prepared to gently offer a tissue with eyes of support and compassion. There is no need to ask any questions, formulate any assessments or move to the next marking in the hand. If you own this marking its completely natural to feel stuck in overwhelm and confusion around the intense emotional waves that run through the core of your being. It can feel like you’re drowning. At times you may feel introverted, vague, fearful, delusional and/or uncontrollable rage. This is completely normal on your learning journey to deep awareness. As you observe the confusion around your emotions know that you are now on the path with great compassion for advancement to a place of higher wisdom beyond reason. You can cultivate Divine inspiration from being impressionable to the myriad of emotions surrounding you. Consider positioning yourself to assist others with your unique gift. These fields may include Grief Counselors, Poets, Actors, AA/NA Sponsors, Funeral Directors and Hospice Workers.